The Frugal Family Life: $1/2 Ball Park Angus or Beef Franks Coupon! 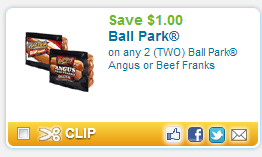 Head over to coupons.com to print a great $1/2 Ball Park Angus or Beef Franks coupon! This one will double at stores that allow which should give us a great deal when paired with a sale! Use zipcode 33133 to find it quickly!